In Electronic Frequencies on Wednesday 24th October at 23.00 Roland Kuit reports on a workshop with students at the Tumo Center for Art and Technology in Yerevan in Armenia. Subject: How to create a sound art installation? In honour of the 100th anniversary of the founding of the First Armenian Republic, the “International Contemporary Art Exhibition: Armenia 2018 “Soundlines of Contemporary Art” was held in Yerevan. Over 50 international artists exhibited across 7 different locations in the city. The Dutch composer/sound artist Roland Kuit was invited to exhibit in the Khachachurian Museum (see photo) . In addition he will mentor TUMO Center for Art and Technology students in the creation of a group exhibition. 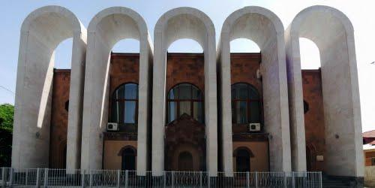 During the ICAE2018 in Yerevan, workshops will be held in a number of leading art institutes, including the Tumo Center for Creative Technologies. On Wednesday 24th October in Electronic Frequencies Rolan Kuit reports on this creative hub in the Tumo Center for Creative Technologies in Yerevan. At this institute students are taught new artforms via teaching labs. SOUND MAPPING YEREVAN: And how to create a sound art installation? How aware are we of the sounds around us? Composer and sound artist Roland Kuit taught a learning lab. The lessons gave students insight into how to record sounds in towns. Not with headphones via your mobile phone, but with a recorder in your hands on a voyage of discovery of the sounds at different locations in Yerevan, particularly the metro network. Click here for more information about SOUND MAPPING YEREVAN in Electronic Frequencies on Wednesday 24th October 2018.